The park is within the Cascade Range and Modoc Plateau natural region, with 910 acres of forest and five miles of streamside and lake shoreline, including a portion of Lake Britton. 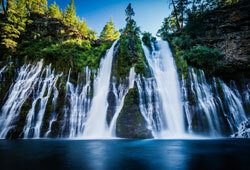 The park’s centerpiece is the 129-foot Burney Falls, which is not the highest or largest waterfall in the state, but possibly the most beautiful. Brand new store! A great place to take a break from your busy day hiking, camping, or boating, the Park store has a variety of healthy grocery items, gifts, and souvenirs. We also have a wide variety of snack items and a beautiful setting to relax and enjoy them. The park is northeast of Redding, six miles north of Highway 299 on Highway 89 near Burney.